"Welcome to my latest creation, JYM Supplement Science. JYM combines real science with real ingredients to deliver unreal results. 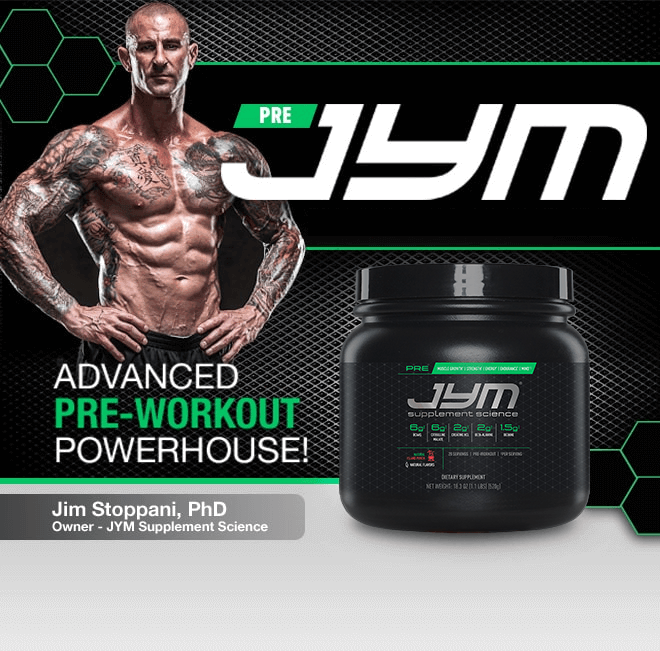 Pre JYM, my cutting-edge pre-workout product, has revolutionized the pre-workout category." Supplement companies love to claim they've created a real “game-changer.” Pre JYM doesn't play that game. It doesn't need hype or flashy marketing. 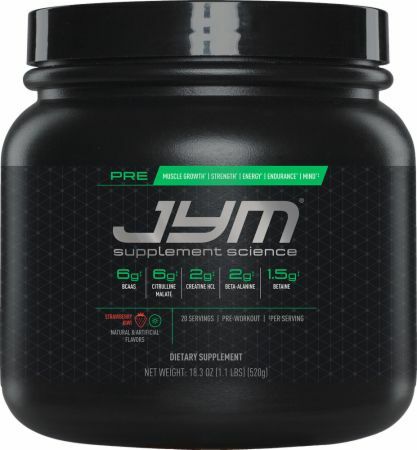 With 13 hand-picked ingredients included at full amounts, Pre JYM is in a league of its own. 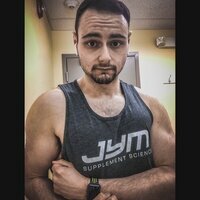 Put simply, Pre JYM is the most effective pre-workout supplement I've ever developed. It's built on solid science and decades of professional experience. Nothing is hidden, and there is no filler. Pre JYM is research made real. It's pure pre-workout fuel." Look at the supplement facts panel on your favorite pre-workout product and you'll most likely see the term “proprietary blend.” Supplement companies want you to think this means they've created a special blend of ingredients that magically work together to deliver unique results. Because this blend is so amazing, they have to keep the amounts of each ingredient secret so no other company steals the formula. The truth, however, is that propriety blends can serve a different purpose. They allow some supplement companies to hide how little of each ingredient they've actually put in a product. This can result in cheap, under-dosed, ineffective supplements. Pre JYM doesn't use proprietary blends. Take a look at the supplement facts panel and you'll see the actual amounts of all 13 ingredients. I have nothing to hide. I'm proud of the amount of each and every ingredient I've included. For the reasons detailed above, many supplement companies are moving toward transparency and axing proprietary blends. That's a good thing. However, some of these companies are still guilty of grossly under-dosing ingredients. Take citrulline malate, for example. The research on this potent amino acid shows that you need 6 grams per serving. Most pre-workout products leave out citrulline entirely, and only a few of them provide anywhere close to 6 grams. A handful of companies are as fed up as I am with proprietary blends and under-dosed formulas, but they fall short by using “abbreviated” formulas. An abbreviated formula is one that uses proper dosing of all ingredients, but only includes a few ingredients. Take, for example, a pre-workout formula that includes beta-alanine, creatine, caffeine, and tyrosine. There's nothing wrong with it, but it could be made a lot more effective through the addition of ingredients like citrulline malate, betaine, and BCAAs, to name just a few. Why would companies not create the most robust formula possible? Because adding more ingredients costs too much money. Pre JYM includes 13 ingredients that complement one another to prime the body for intense workouts, making it a complete pre-workout supplement. If you're looking for the most complete exercise supplement program available on the market today, take my Post JYM Active Matrix after your workout to get even greater amounts of potent ingredients like Creatine HCl, Betaine, and Beta-Alanine. Some companies also try to trick buyers by calling their pre-workout product “concentrated.” A serving of one of these “concentrated” products can contain as few as 3 to 6 grams of powder. What kind of magic did they use to cram enough creatine, beta-alanine, citrulline, arginine, caffeine, and other ingredients into that tiny serving? They didn't use any magic, which is why some of those “concentrated” formulas also include proprietary blends. That's also why the serving size of Pre JYM is more than 26 grams. It contains 13 ingredients at proper, powerful amounts. I've been studying supplement science in the lab and gym for decades. I've been delivering supplement advice to millions of people in the pages of Muscle & Fitness, FLEX, and Muscle & Fitness Hers, as well as here on Bodybuilding.com and my own website, JimStoppani.com, for over a decade. Most importantly, I've been training since I was 11 years old. Before each of my workouts, I would draw on all of my experience and all of my education to concoct my own pre-workout supplement, combining ingredients from 13 different bottles and tubs. Full amounts of 13 science-backed ingredients. Studies suggest the optimal ratio of leucine to isoleucine to valine in a pre-workout product is 2:1:1, exactly the ratio in Pre JYM. Research also suggests that subjects supplementing with citrulline malate before a chest workout could complete more reps on most sets compared to subjects taking a placebo. Research suggests that carnosine increases strength and power, improves endurance and recovery, and muscle growth. * This is increased further when taken together with creatine, as in Post JYM Active Ingredients Matrix™. Beet root extract is a rich source of nitrates. When you consume nitrates, they are broken down first to nitrites and then to nitric oxide (NO). 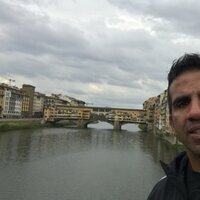 I follow jym on FB and he convinced me that his products were superior to anything else. I finally gave pre kaged a try and I’m hooked!! Pre kaged is the most amazing preworkout that I have ever used. Makes me look forward to going to the gym again. I can workout much longer then ever before! Very good product with all the supplements that you need in one sip! Choos it because of good reviews but this product not that good for energy, gives you a little boost, too sweet so you need to add a lot of water. Will never buy again. Do I feel pumped after this for a workout? Yes Does the rainbow sherbet taste like the insides of a unicorn? Also yes. Recommend trying a different flavor. Great preworkout but definitely don't recommend taking later in the day if you already have insomnia issues. Steady flow of energy/ focus without a huge crash, as a student I really appreciate the lasting effects to study after my workouts without feeling jittery. I havent had any stomach issues with this product. Some other products have caused an itchy/ tingly sensation, I haven't had that issue with pre jym. Great product for maximizing your workout pushing past physical and mental blocks. I think some people underestimate that a preworkout helps with more than just muscles but also with your brain! The sweetness of the product is kind of like candy without being grossly sweet, which helps curb other sweet cravings throughout the day. Cherry Limeade tastes a lot like the Cherry Limeade minute made flavor you can try at the Coca-Cola free style dispensers. It is a bold/ robust/ strong flavor. I'd like to try other flavors but been a bit hesitant to stray away from something I know I already love. The Rainbow Sherbet is a lighter flavor, still sweet without that punch like the other 2. I only tried a sample pack once or twice but it seemed like you could taste the aminos just slightly more than in post jym of the same flavor. The cheap little sorbet cups a lot of us had as a kid would be a good reference for the taste except it tastes a little more subtle than that and also no dairy. I tried the Black Cherry flavor once because the Cherry Limeade was out of stock. I figured they'd be very similar but I was wrong. The Black Cherry tastes more artificial in my opinion, kind of like a Cherry Kool-aid. If my favorite flavor (Cherry Limeade) goes out of stock I'll try a different flavor over this one. This one is also a strong flavor. Overall a top pre workout. Gave it a 9 because it messes with my stomach a little bit and isn’t the best pre wo I’ve had. I would still recommend. I’ve tried a lot of pre’s and this is the best! No jitters, no crash. Body feels awake for a great workout. Love this product. It gives me a little extra boost during my workout like no other product has done in the past. 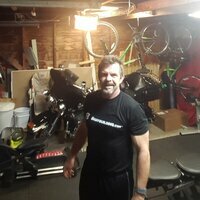 I am 60 years old and need that boost to make through each workout. The only issue I have with it is the sweetness. I do believe they could tone that down a bit. This is the best pre workout hands down. Clinically dosed and backed by science to give you the correct doses of nutrients needed for every workout. Transparent label and no lies! Ever since I switched to jym’s supplements, I have seen greater results in my performance, strength, and overall mental focus. I highly recommend this pre workout and the whole Jym line! Awful taste! This is one of the worst tasting pre-workouts I've tried. It does however give you a good start to your workout. If a good sweat is your goal this product will hit the mark. ** The % Daily Value tells you how much a nutrient in a serving of food contributes to a daily diet. 2,000 calories a day is used for general nutrition advice. Dextrose, Natural and Artificial Flavors, Sucralose, Acesulfame Potassium, Calcium Silicate, FD&C Red #40. Directions For Pre JYM: Mix 1 scoop of Pre JYM in 14oz. of water and drink 30-45 minutes before workouts.